Our exclusive formulas, quality raw materials, and an eco-friendly manufacturing process produce the most performance enhanced running tracks available. Straight from Hellas Polymer factory to your facility, where our installation crew will install your surface. From full-pour track systems to sandwich track systems to paved-in place basemat systems, Hellas will evaluate your needs and provide you with the best option for your project. 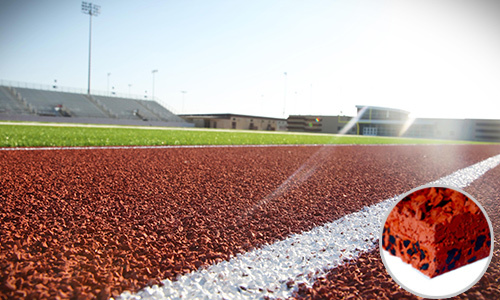 The layout and design, lines, and event markings of every track are in accordance with the latest edition of the IAAF, NCAA, NFHS, or UIL rules and regulations. epiQ TRACKS® are manufactured in the USA using components that are non-petroleum-based and contain zero heavy metals. 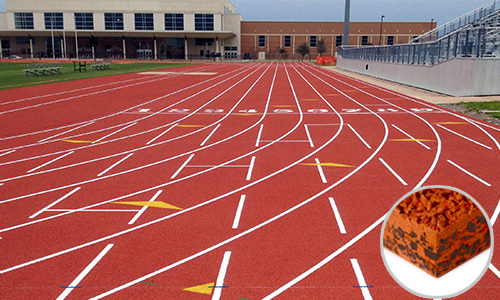 This Olympic quality, IAAF certified track exemplifies the highest standards in performance excellence. The Z5000 is our top-of-the-line running track system, offering comprehensive cushioning, control, energy return, and performance. The epiQ TRACKS Z5000 poured-in-place running track surface of impermeable design is installed in a multi-layered application. The base layer consists of two-component polyurethane, followed by SBR rubber, a middle layer of two component polyurethane/SBR, and a top layer of flow-applied polyurethane. Finally, the track is broadcast with EPDM rubber. The result is a durable, resilient, energy absorbing, all-weather surface - resistant to UV degradation, abrasion, shrinkage, mold and most common oils, and chemicals. The encapsulated epiQ TRACKS G4000 system is similar to the Q3000 but with added thickness. It is a Grand Performance System; a poured-in-place running track surface of impermeable design, installed in a multi-layered application. The base layer consists of two-component polyurethane and SBR or EPDM granules. The top layer is a flow-applied layer of the identically pigmented polyurethane and embedded, pigmented EPDM rubber granules, which are then sprayed with a UV stable protective coating. The result is a durable, resilient, textured, all-weather surface. The encapsulated epiQ TRACKS Q3000 system is our Preferred High Quality Performance System; a poured-in-place running track surface of impermeable design is installed in a multi-layered application. The base layer consists of two-component polyurethane and SBR granules. The top layer is a flow-applied layer of the identically pigmented polyurethane and embedded, pigmented EPDM rubber granules, which are then sprayed with a UV stable protective coating. The result is a durable, resilient, textured, all-weather surface. 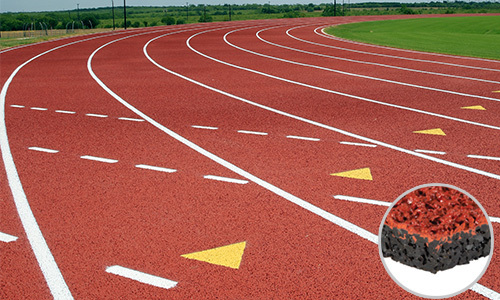 This value-added, IAAF certified, impermeable running track surface is comprised of graded, black SBR rubber granules bound together with a polyurethane binder. 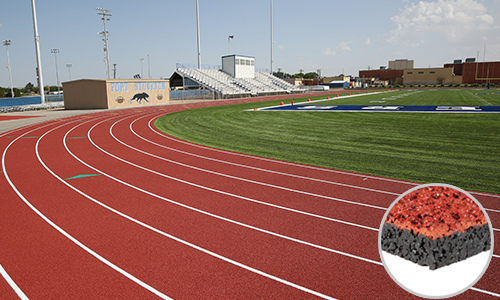 The top surface layer is a composition of colored EPDM granules and similarly colored two-component polyurethane, identical to our top of the line epiQ Tracks Z5000 surface. The epiQ pore sealer utilized in the 1000 system is yet another unique technological innovation separating epiQ from all other system manufacturers in the market today. epiQ’s proprietary Single Cast Sealer (SCS) creates a thixotropic effect with a seamless binding single layer, eliminating the need for rubber dust application. While the traditional rubber dust application merely coats the surface, the SCS process actually seals the pores by creating a mechanical lock with the subsequent layer. This requires less labor and results in a superior product. This impermeable paved-in-place synthetic sport surface is our value system, comprised of a base layer of polyurethane bound rubber granules, which are sealed and topped with a spray-applied coat of one or two-component polyurethane and EPDM granules. The epiQ pore sealer utilized in the X1000 is also utilized in this system making it a stronger and longer lasting product. 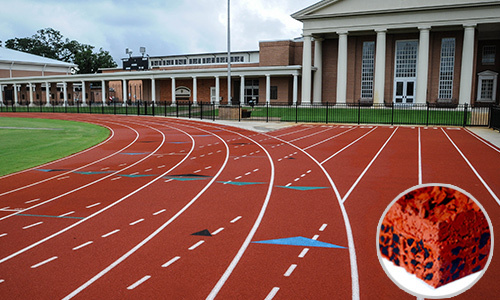 This porous paved-in-place synthetic running track sport surface is our basic system comprised of a bottom layer of polyurethane bound rubber granules topped with a spray-applied coat of one or two-component polyurethane and EPDM granules. 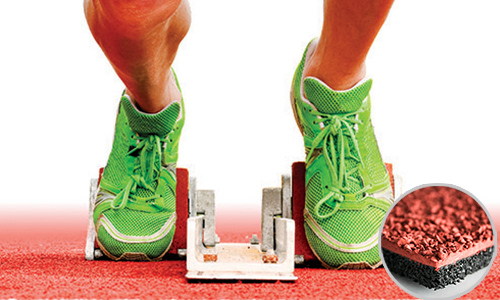 The epiQ TRACKS Dyad is a premium dual-layer track system and IAAF Certified Product. The 10mm prefabricated basemat is made of a high-grade recycled rubber, and coated with a moisture-cured VOC-free adhesive. The base mat is then crowned with layers of EPDM rubber and sealed - using our proprietary Single Cast Sealer (SCS), which creates an exceptionally strong bond and prevents de-lamination – differentiating this system from other track products. This impermeable sandwich system uses a proprietary polyol blend with no isocyanates or added solvents. 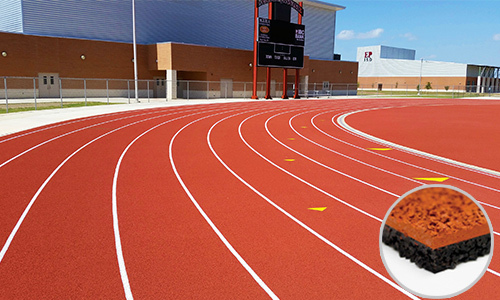 The epiQ TRACKS Dyad system is also coated with a UV-resistant, two-component polyurethane that is highly resistant to abrasion, resulting in a resilient and highly durable running track.